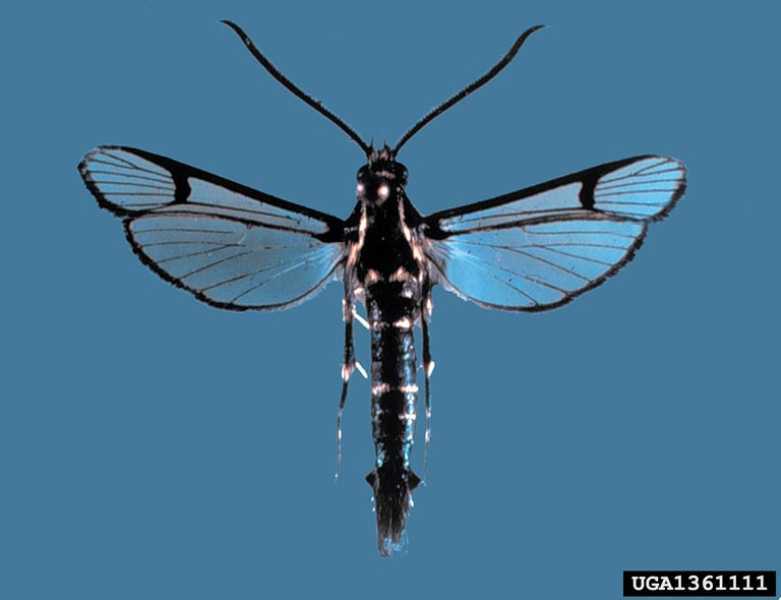 The peachtree borer, Synanthedon exitiosa, attacks stone fruits, especially peaches and nectarines. Damage is found either in the crown area or the lower part of the trunk near the soil line. These pests can girdle and kill healthy young trees. 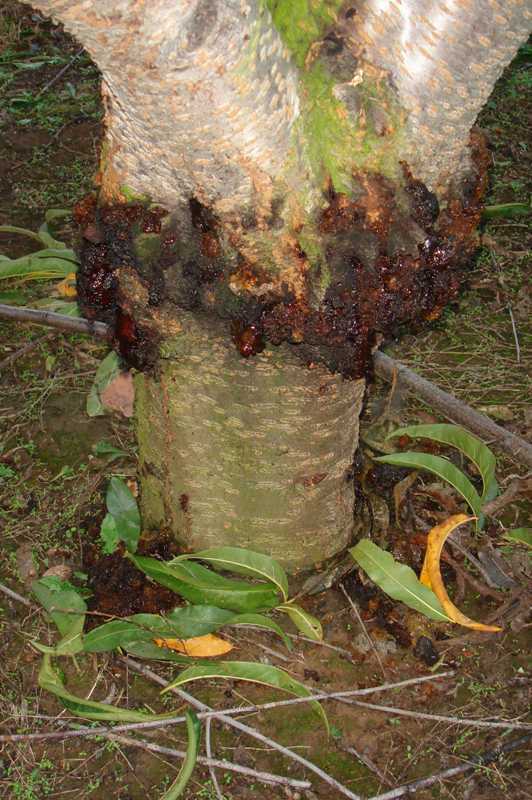 Older trees are sometimes attacked, but they usually tolerate the damage unless there are many larvae or a tree is attacked several years in a row. Holes appear in the lower part of the trunk or in the upper trunk and lower crotches. A thick, gummy or jellylike sap often oozes from these holes. Sawdust may surround the holes or collect at the base of the tree. In mid- to late-summer, some of the leaves and branches may wilt. Severely affected trees may die. 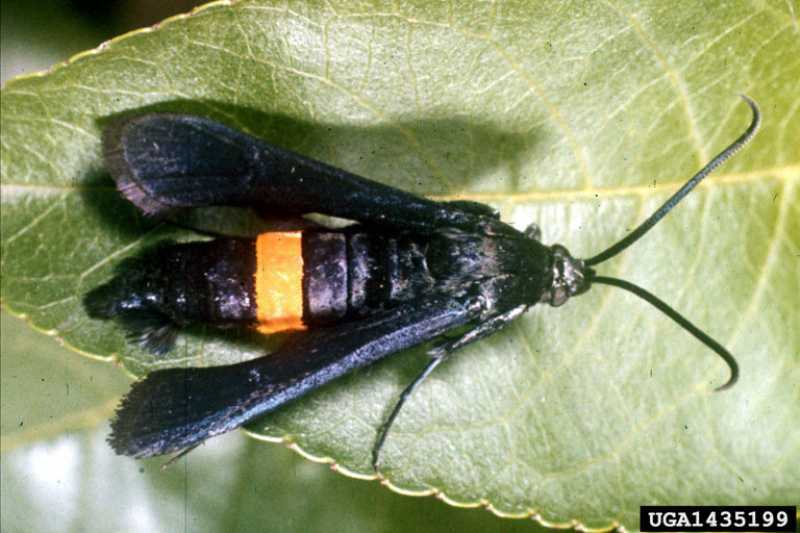 The adult peachtree borer is a steel blue to black moth that resembles a wasp. 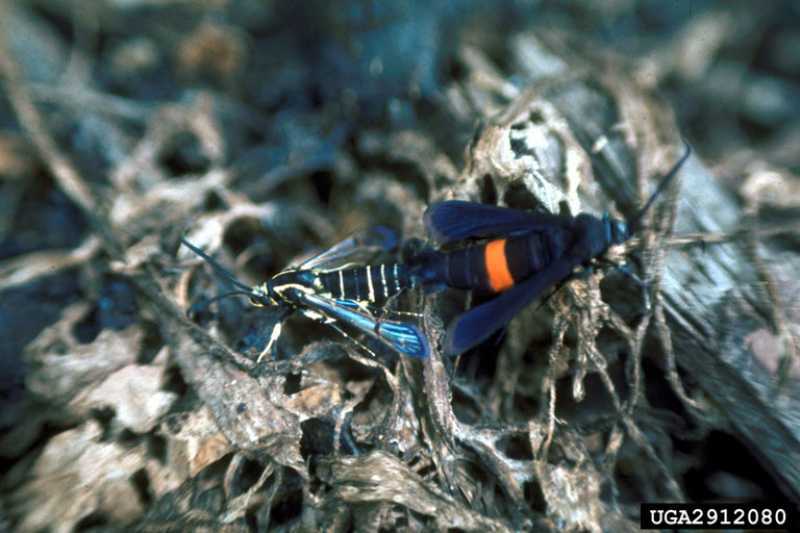 The adult borer emerges in the late spring and early summer. The clear-winged female moths lay their eggs on the bark at the base of tree trunks in mid- to late-summer. Hatching larvae tunnel into the tree at or slightly below ground level. The larvae are dull white to light brown or pinkish worms with a darker-colored head. They feed in the crown area and burrow up into the tree, leaving small piles of reddish-brown frass (waste material of the borer) at their burrow entrances. The tunnels that the larvae make interfere with the circulation of water and nutrients, causing twigs and branches to wilt and die. These borers feed throughout the winter and into the spring. The borers pupate in early to midsummer in cocoons located at the base of the tree or just inside their tunnels. Adult moths emerge 20 to 30 days later. The peachtree borer has only one generation a year. 1. Mechanically remove borers. 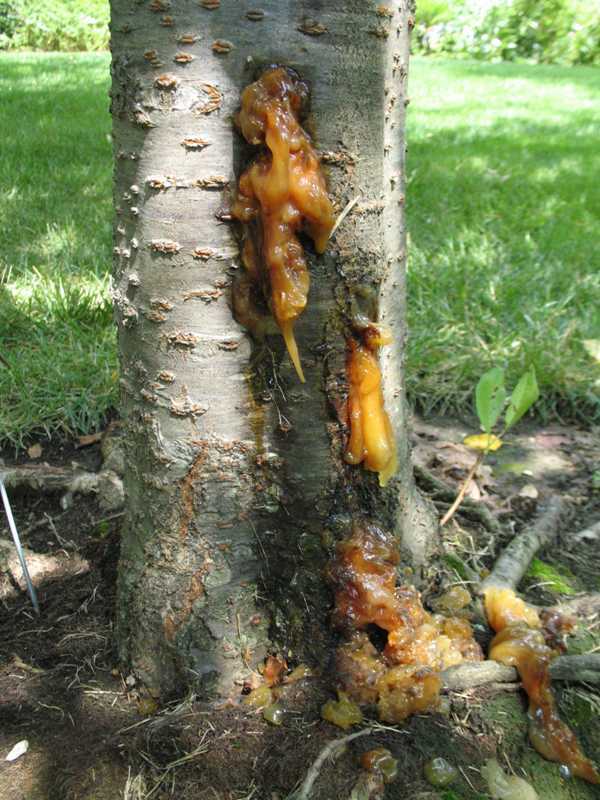 If only a few trees in a backyard situation are infested, you can remove borers through a technique called worming. 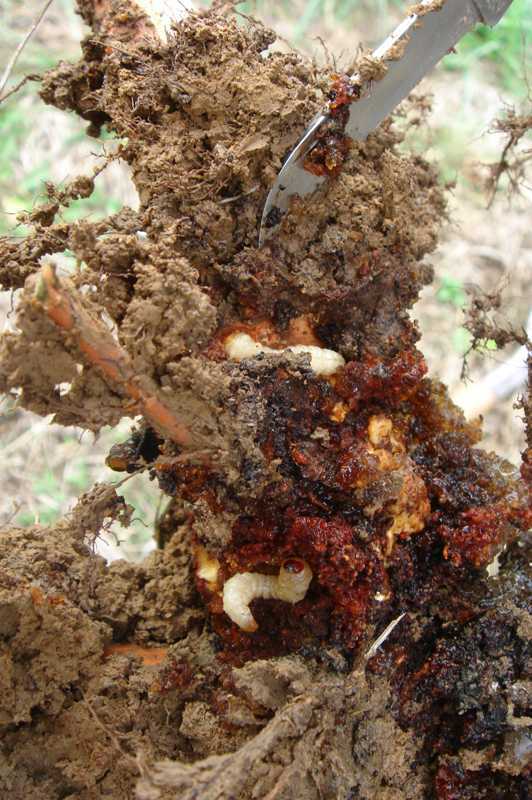 Remove the soil from around the base of infected trees, and use a pocketknife or some other pointed instrument to dig the larvae out. Be careful; it is possible to seriously injure the tree if too much bark or wood is removed. Individual borers may be killed by inserting a wire into their holes. 2. Keep trees vigorous. Use good sanitation practices, adequate irrigation, and good pruning techniques to keep trees healthy. 3. Avoid wounds or mechanical injury of the trunk and upper branches. Wounds can provide entry points for borers. 4. Use insecticides if necessary. Spray or paint only the trunk and lower limbs with either carbaryl (Sevin) or endosulfan (Thiodan) in the first half of May and again in the first half of August as a preventative. Permethrin can be used on non-edible plums. To avoid killing bees, do not spray during bloom. 5. Examine your trees yearly.The best time to check your trees is in the fall. 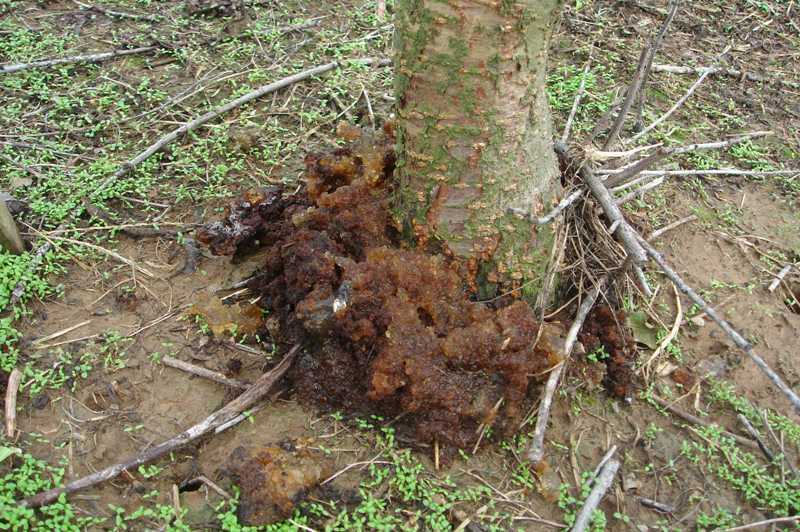 Look for small accumulations of frass on the lower tree trunk, especially on trees that appear weakened. Strategies 1, 2, 3, and 5 are strictly organic approaches. 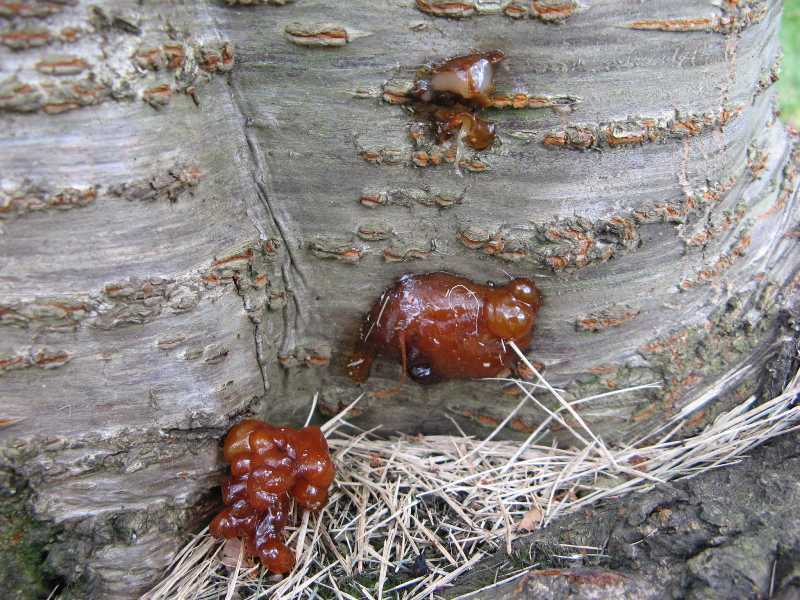 The thick, gummy or jellylike sap oozing from the trunk of this cherry tree (Prunus) should be scraped off to discover if it is caused by peachtree borers (Lepidoptera), although gummosis from a borer would be mixed with frass.